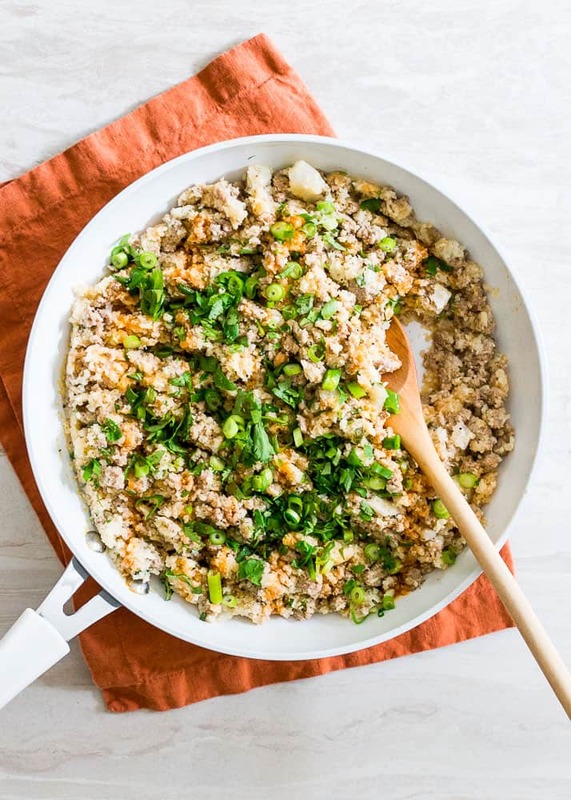 This 4-ingredient buffalo turkey cauliflower skillet makes a quick and easy, healthy dinner and doubles as a great meal-prep option for the week! If you’re a lover of quick and easy meals (and who isn’t? ), this buffalo turkey cauliflower skillet is definitely for you. I’ve been a bit MIA on here lately and it’s not for lack of cooking! I’m actually weirdly, out of the blue, majorly into meal prep these days. It’s funny because I’m pretty sure I’ve written posts on here talking about how it just wasn’t for me – I like spontaneity, I have no reason to prep when I work from home, I don’t want to spend a better portion of my day cooking for the entire week, etc. But something happened while I was in Portugal last month. I hit the point in vacation where you can’t wait to get home and back to eating normal/healthy and I just had all this unfounded motivation to start meal prepping. Pretty sure the only other time I’ve catered a recipe on here to meal prep was these Slow cooker shredded Mexican beef bowls. So I came home and I’ve been going strong with it for a month now. I haven’t really thought to share much of what I’m making (aside from some impromptu Instagram shares like this pumpkin cherry oat bread) because the reality is that I keep things really simple when it comes to meal prep. Partly because it makes prep easier (aka – I prep “components” more so than full on meals) and partly because when you’re tracking macros (which I do), simple meals mean a lot less macro math and fidgeting with My Fitness Pal. The thing is, everyone likes simple right? So I decided to take a few basic pictures to go with this very basic recipe and share! 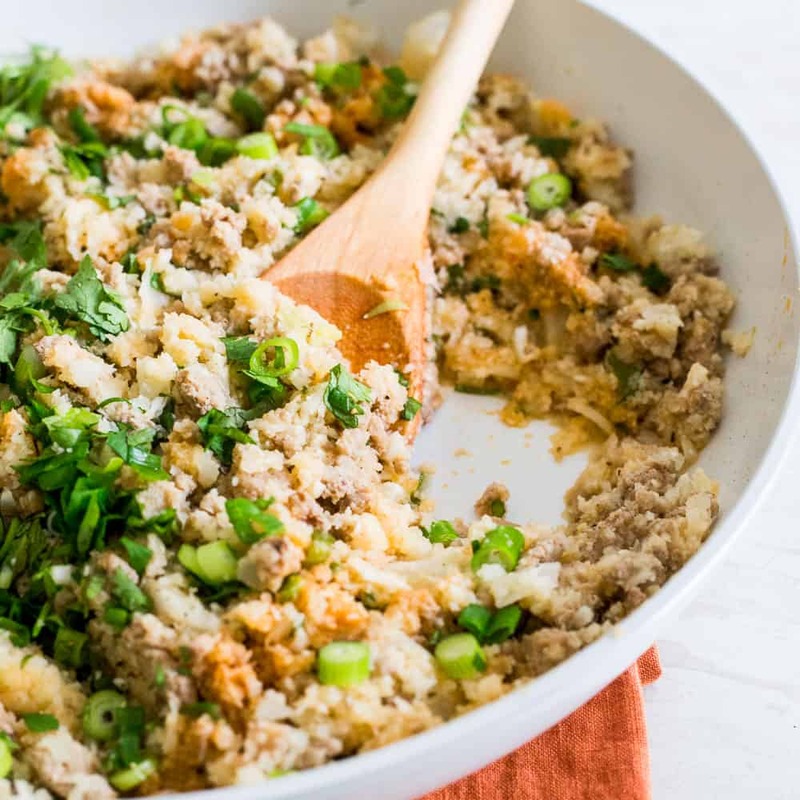 What ingredients do I need for this buffalo turkey cauliflower skillet? 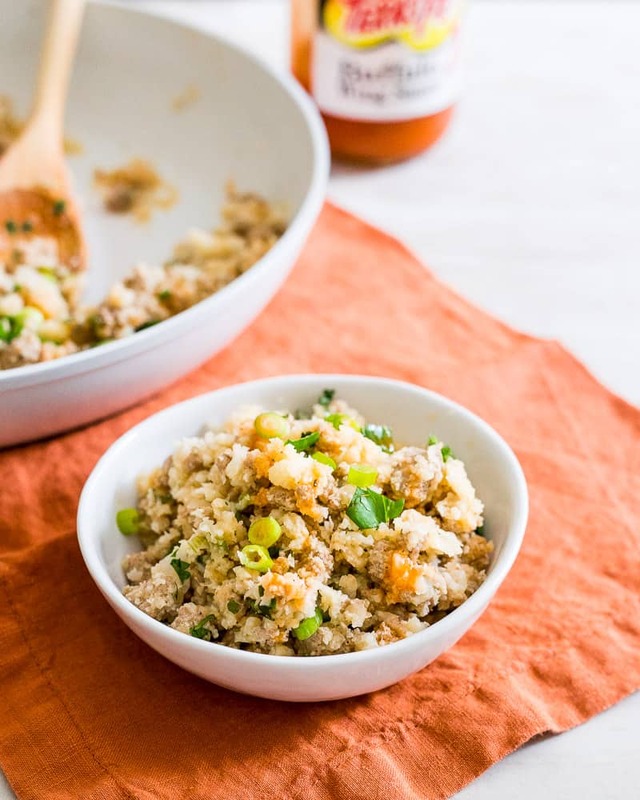 Frozen riced cauliflower bags are totally fine and make this recipe even quicker. I riced my own in the food processor because I happened to have a head of cauliflower in the fridge that needed to be used. Texas Pete buffalo wing sauce is what I used and makes life easier than making your own with butter + Frank’s red hot. Not to mention, the macros are better using this stuff. Fresh herbs are key whether it’s green onions or cilantro, the pop of greenery both visually and for the brightness in each bite is key to balance the heat of the buffalo sauce and to bring some life to the turkey and cauliflower. One more word on this easy skillet dish – be generous with the salt and pepper. Turkey and cauliflower are two kind of bland ingredients, they need some seasoning love. Use probably double the salt you normally would, trust me. How do you eat this buffalo turkey cauliflower skillet? You can totally put this in a bowl and call it a day. Maybe throw a fried egg on top? Mmmm. Put a serving on some salad greens, use a creamy blue cheese or ranch dressing (to go with the buffalo theme) and throw in some of your favorite salad toppings like cherry tomatoes, or bell peppers – both are great complements to the ingredients in the buffalo turkey cauliflower. Turn it into a quesadilla or flatbread. I love Joseph’s lavash wraps (if you’re tracking macros and not using these in your diet, you’re missing out!). Melt some grated cheese on your favorite pita/lavash/tortilla and top with a serving of the buffalo turkey cauliflower. If you love buffalo sauce, you’ll love these other recipes too! If using fresh cauliflower - wash and trim then place florets in a food processor and process until "riced". Set aside. Place a large greased skillet over medium-high heat. Add the turkey once hot and cook, breaking up with a spatula until browned. Drain water from the skillet then add the riced cauliflower to the turkey. Season generously with salt and pepper. Cook for another 5 minutes, stirring often until cauliflower is softened. Add the buffalo sauce to the skillet and mix until thoroughly combined. Remove from heat, add the chopped herbs to the skillet and serve.